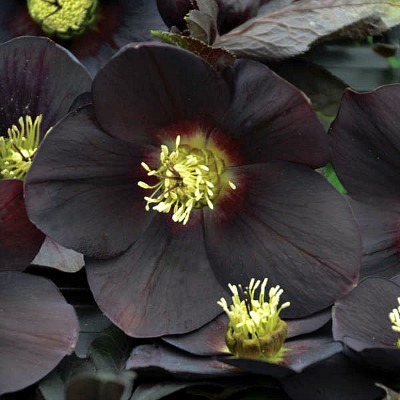 If you love showy flowers with notable floral displays, and rich colors, then you will love the Helleborus 'New York Night' or Lenten Rose as it is also commonly referred to. It is a hardy plant with beautiful 2 ½”-3” flowers with almost black colors: deep gray, jet black, and black-purple. The flowers sit atop a green foliage. It grows to a height of 18”-24” and with an equal spread. Bloom time for the Lenten rose begins in late winter, and continues for six weeks through the spring. They usually flower during Lent season, and that is where they get the name ‘Lenten Rose’ from. For most vigorous growth, we recommend spring care for hellebores plants. They are low maintenance flowers, and mostly disease and pest-free, which means they are going to be absolutely easy to care for. They also adapt well to any growing conditions. they however, prefer moist, organic soils, but will also grow in clay or sandy soil, slightly acidic to slightly alkaline soils, and even tolerate short drought periods. They also love the shade, and can be planted under deciduous trees to shield them from the hot afternoon sun. Trimming should be done in the spring to get rid of last year’s foliage. If you want more hellebores in your garden, you should apply heavy mulch in the fall. This will provide a growing ground for new seedlings that can be transplanted come spring. Helleborus are great for woodland areas, and the fact that they are active in the cold months make them perfect for adding life to any garden when most other plants are inactive. They are also great for mass planting, as a border plant, or for growing in containers. It is deer and rabbit resistant, but bee friendly. Thank you to Walters Gardens for their beautiful picture of the New York Night Hellebore flowers. New York Night Hellebore is grown in one gallon containers.